MANCHESTER SHOW 2010: Peachtree Audio lands in the UK with trio of new products | What Hi-Fi? Retail partners, Sevenoaks and Audio-T, have announced the Peachtree Audio Nova will be exclusively available in their stores until January 2011. The first stocks of the Nova are in shops now. Watch our video news report on the Peachtree iDecco iPod dock and onboard DAC, on show here at Manchester. We've already put in a request for a review sample, so hope to be testing it soon. US company Peachtree Audio, which specialises in products designed to make the most of digital music files, is launching a trio of amplifiers with DACs in the UK. Whether your music is stored on a PC, Mac or accessed from iTunes, an Apple TV, Squeezebox or Sonos system, Peachtree says its products are designed "to reproduce the music the way it was intended". The three models being released in the UK this October are the Nova (£1099.99), Decco2 (£849.99) and iDecco (£999.99). • Nova: 80W-per-channel integrated, Class A valve amplifier with onboard ESS 900 Sabre DAC; 3 analogue, 5 digital inputs (inc 1 x USB); built-in headphone preamp; rear slot for connecting a Sonos ZP90 zone player; home cinema bypass on analogue input 3. Available in black, rosewood or cherry finishes. • Decco2: 40W-per channel integrated amplifier with onboard DAC; Class A valve preamp; 2 analogue, 3 digital inputs (inc. 1 x USB); headphone preamp; slot for connecting a Sonos Z90; ESS 900 Sabre DAC. Available in black. 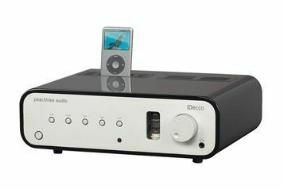 • iDecco: 40W-per-channel hybrid valve amp with 'Pure Digital' iPod dock and onboard DAC; takes digital signal from iPod and uses its own DAC for digital-to-analogue conversion'; otherwise same spec as the Decco. Available in black. Jim Spainhour, managing director of Peachtree Audio, says: "We're a dedicated group of audiophiles who believe that consumer-friendly industrial design is just as important as the highest level of performance. "Our products must also be futureproof, so we have added features to address the vast array of computer audio products on the market." Peachtree Audio products will be distributed in the UK by Computers Unlimited.